At Elite Medical Aesthetics, we offer: Vaser Liposuction (Ultrasound Assisted) SmartLipo (Laser Assisted liposuction) and Tumescent Liposuction with Microcannula. 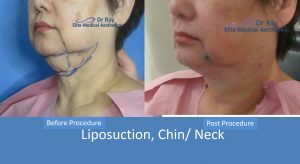 To find out if liposuction would be suitable for you, request a Free Consultation with Dr Ray. Disclaimer: With all before and after images shown on the site, no claims are made that results are guaranteed to be exactly the same. Results will vary by individual patient and no guarantees are made. Images of actual patients are shown for informational purposes only and Individual results may vary*.